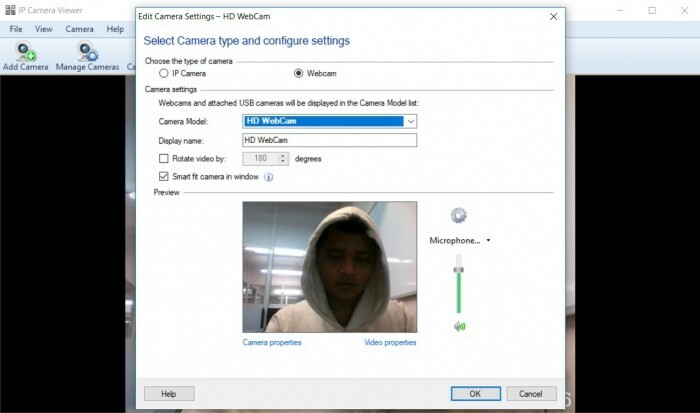 The webcam on your PC can do a lot more than just click the occasional selfie or chat on Skype. Paired with the right software, you can use the humble webcam to take wide-angle selfies with your friends and family, or even use it for surveillance purpose. However, different users utilize their webcams in different ways, some want fancy effects to spice up their video feed, while others want something that can just get the work done. 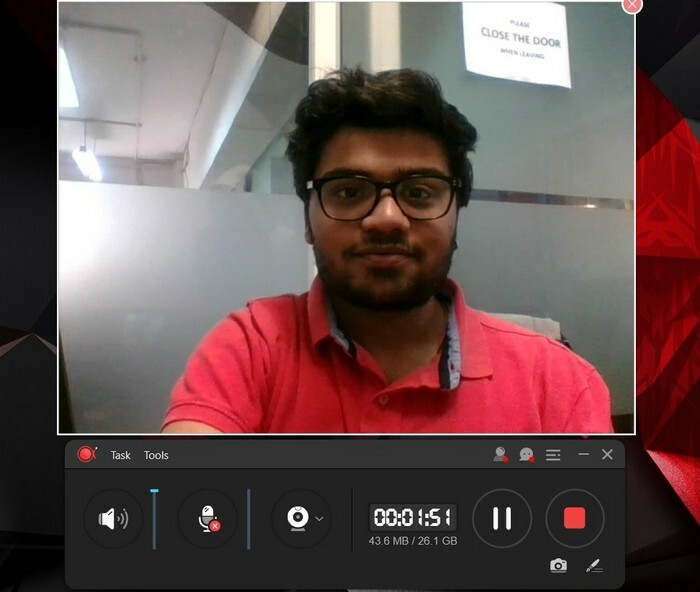 Keeping in mind the aforesaid points, we have compiled a list of the 10 best webcam software for Windows and Mac that stand out on certain parameters, be it their slick user interface, the diversity of editing tools, ease of usage, etc. So, without any further delay, let’s go through our list of the 10 best webcam software which consists of both free and paid options. 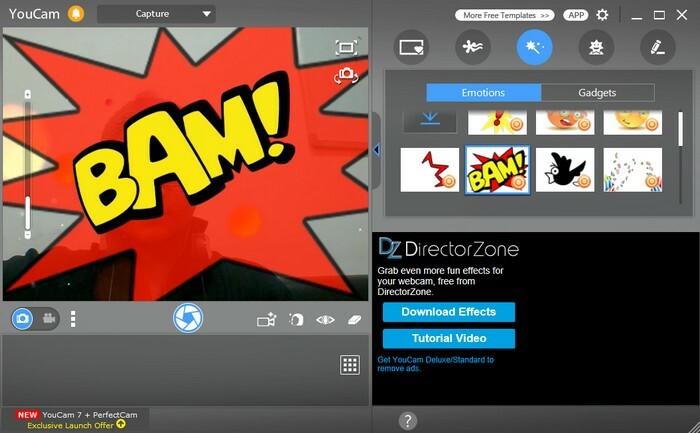 Youcam is one of the most popular webcam software out there, and for a good reason. A clean UI, which is far from the cluttered interface you’ll find in other webcam software, makes YouCam an obvious choice for beginners. But that doesn’t mean the software is a barebones affair, instead, it offers a rich array of editing tools, filters, and effects whose diversity is impressive, to say the least. Scene filters, face distortion lenses, emoticons, dynamic effects, and stickers are just a few of them. Sounds generic? Well, in that case, how about face ‘Avatars’, AR stickers, and live animations to make your video feed look like a well-edited film? YouCam has it all, and then some more. YouCam can also be synced with services like Skype and Yahoo Messenger, and also supports face login functionality for platforms like Facebook, Amazon, Twitter to name a few. On the technical side, YouCam saves images in multiple formats (JPG, BMP, PNG) and is capable of recording videos in AVI and WMV (MP4 too, for systems with VGA cards) file types at resolutions ranging from 240p to Full HD. Burst shot is also on the table, and users can manually adjust the shutter speed to their liking. The only downside? The free trial period lasts only 30 days, after which you’ll have to purchase a paid version. ManyCam is not just simply a webcam app, instead, it can be called a full-blown video-editing tool, thanks to the plethora of presets, filters and effects which are available at the disposal of users. You can add a host of beautification effects like transitions, face masks, emoticons, and backgrounds to record and stream some really artistic videos. 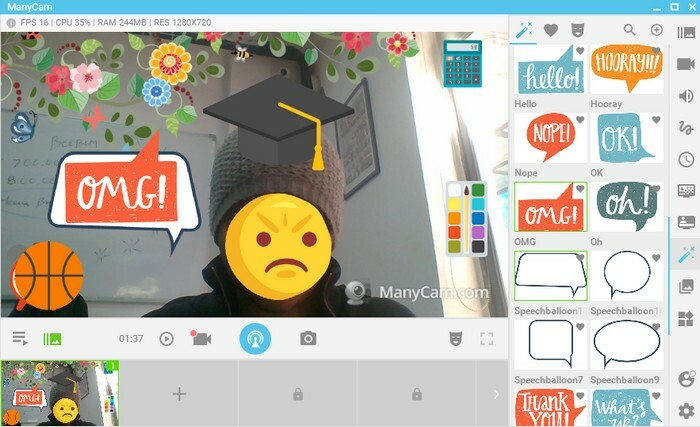 Apart from them, YouTube integration, Picture-in-Picture (PiP) mode and green screen are among the diverse set of goodies that ManyCam has to offer. You can choose to record videos in a wide array of resolutions (240p, 480p, HD, FullHD, etc.) at frame rates ranging from 5-60 FPS in numerous formats like MP4, MKV and FLV to name a few. You can even adjust the audio bitrate values (between 96-192 kbps) and also apply a noise suppression feature which works quite well. Thanks to its vast portfolio of editing tools and effects, ManyCam is a highly recommended option, be it for creating tutorials, recording screen activity or live streaming. Supported platforms: Microsoft Windows 7, Windows 8.1, Windows 10, MacOS X 10.9 and higher. Not all people are big fans of fancy filters and effects, and one or the other time, we all want a no-frills solution. 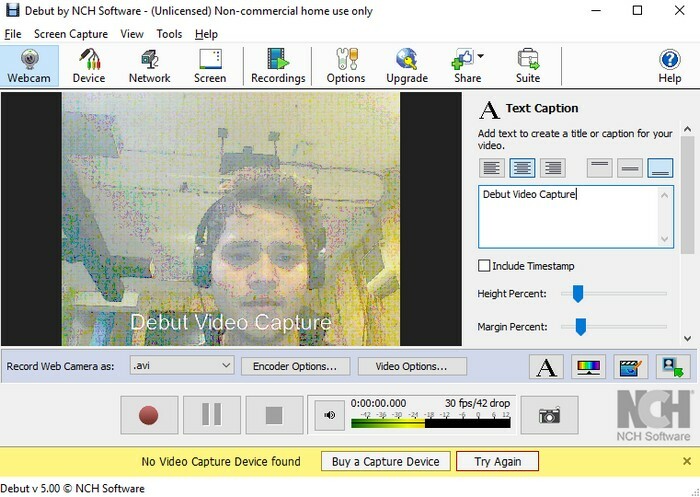 For such scenarios, Debut Video Capture is one of the best webcam software whose clutter-free UI is its biggest USP. (Talk about using MS-Paint for editing images). All that you get in the name of video editing tools are basic variables like contrast, saturation which can be adjusted by using a slider, and three video filters viz. B&W, Sepia, and Negative. And yes, you get a watermark tool for that tiny bit of personalization you want to add to your videos. When it comes to technical aspects, Debut Video Capture provides a considerable amount of control to users. One can capture screenshots in two file types viz. JPG and PNG, while videos can be recorded in a wide array of formats such as AVI, MKV, FLV, and WMV to name just a few. Users have the flexibility to record screen activity in three aspect ratios (11: 9, 16:3, 4:3 ) in resolutions ranging from as low as 144p to HD, however, frame rate appears to be fixed at 30FPS at all resolutions. 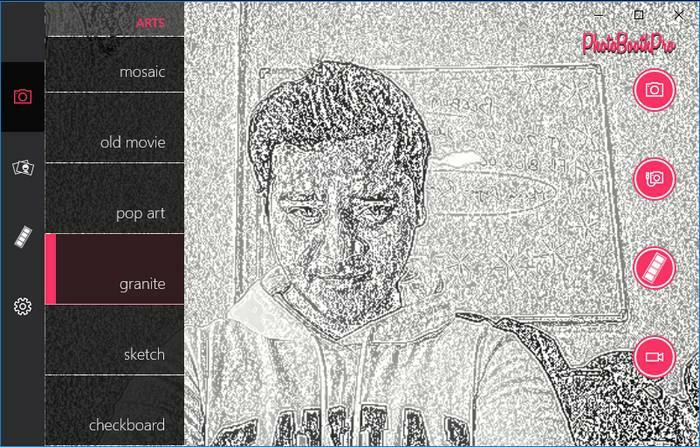 Yawcam is another webcam software whose USP is its simple interface, which more than makes up for its lack of fancy effects with its clean approach to present the core camera tools. 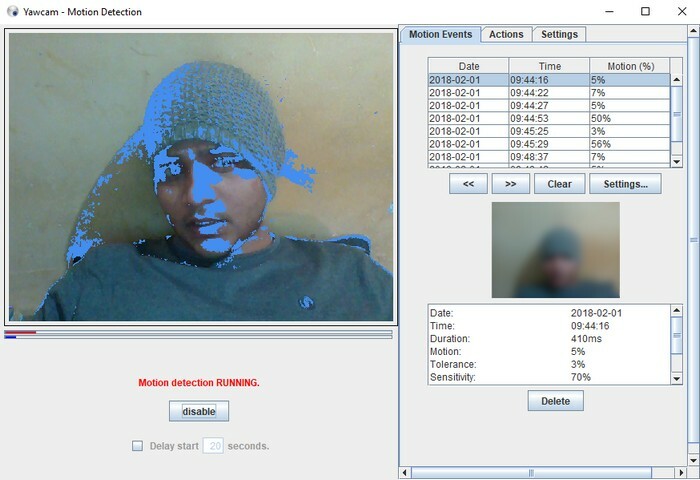 However, the software is not as bare-bones as it appears, because it offers a couple of quite nifty features such as image-to-movie converter, text/image overlay and a nifty motion detection feature which detects any activity in view of the webcam and sends the user an email notifying them of the same. Downloading and installing a third-party webcam software too big of a hassle? Well, in that case, Webcam Toy is your best option. If all you want is to take a quick photo, add some quirky distortion effects and filters to it without waiting for a webcam software to load, head straight to Webcam Toy. Usin Webcam Toy is as simple as it can get. All you have to do is open the website, select the ‘Ready?Smile!’ button followed by clicking on the ‘Use my Camera’ button to get started. You can choose from five presets (Mirror, Square, Countdown, Flash, Fullscreen) and select from the wide array of effects from the side-scroll buttons. One can choose to save the clicked images either locally (only JPG format) or post them directly to social media platforms like Facebook and Twitter straight from the website. When it comes to webcam software, slow load speed and camera lag are a common issue, but not for Photo Booth Pro. The software is not only zippy, it also features a host of mirror effects and filters which can be tested in real time before recording a video or clicking a photo. Photo Booth offers effects like axial mirror effects, distortion lenses, blur effects and artistic filters to express your creativity. And hey, there is also a cool photo-strip feature that will let you capture four images with different filters and arrange them in a strip, whose layout can be tweaked later on. Images are saved in JPG format locally and can also be uploaded on OneDrive. Moreover, one can also post them on Facebook and Twitter straight from Photo Booth Pro. On the other hand, videos are recorded in MP4 format in two aspect ratios viz. 16:9 and 4:3, however, resolution and frame rate are fixed at 640 x 360 and 30FPS respectively. If fluid interface and vast toolkit is a combination you seek in a webcam software, you can never go wrong with Apowersoft Free Online Screen Recorder. In my opinion, Apowersoft’s webcam software is an ideal choice for clicking images, recording audio files and capturing videos. The software’s home screen contains just the basic controls, but once you open the settings menu. you’ll realize that Apowersoft’s offering has all the tools and options to let you record your screen activity in whichever form or format you like. The Apowersoft Free Online Screen Recorder saves images in numerous formats (PNG, JPG, BMP, etc. ), while videos can be recorded at frame rate values ranging between 5-60 FPS in a wide array of file types such as MP4, WMV, AVI and FLV among others. You even have the option to record audio files in various formats such as MP3, AAC, FLAC and can also choose from different codecs as per your liking. In case you were wondering, the Apowersoft offering also boasts of Google Drive and Dropbox integration to let you quickly store your files on the cloud, aside from the option to share them on YouTube and Vimeo. Aside from live streaming and video chatting, webcams can also play an active role in surveillance. And one of the best software suited for the aforesaid task is IP Camera Viewer, a webcam software that will let you monitor and safeguard your home and workplace via IP cameras. The software has support for over 1800 different IP camera models and allows users to separately configure and customize the video properties like orientation, frame rate, coverage area, etc. of each IP camera they have added to the network. The software can record videos in three resolutions viz. 360p, 480p, and 720p, whose properties (contrast, saturation, sharpness, etc.) can be manually adjusted. Moreover, users can perform digital zoom on a frame even if their IP camera does not have the zoom functionality. The software can add up to four cameras at once and lets users view their video feed simultaneously on a single screen. 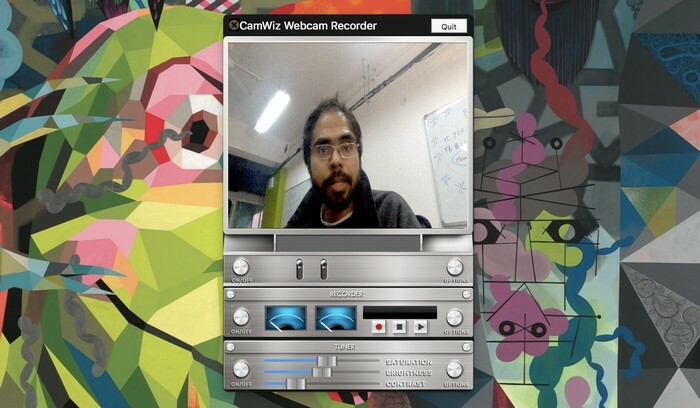 Camwiz Webcam Recorder is one of the simplest webcam apps one can find in the domain, but its only drawback is the fact that it is exclusive to the macOS platform, so users registered on the Windows ecosystem are out of luck. Limitations aside, Camwiz features a very clean UI with all the core recording tools located on the home screen itself, thanks to the simple three row arrangement which contains camera toggle, recorder tools and tuning options. A peek inside the software’s settings menu reveals that Camwiz also comes with some additional nifty features such as Motion Detection, Remote Webcam, and Screen Cam capture to name a few. Users can apply effects such as time stamp, night vision and view flip to the videos, which are recorded in resolutions ranging from 240p to 1080p. Moreover, you can also use Camwiz as a virtual webcam for other apps on your macOS device. Despite not being a third-party software with a lot of editing tools and effects, Windows Camera gets the job done as an effective webcam software. 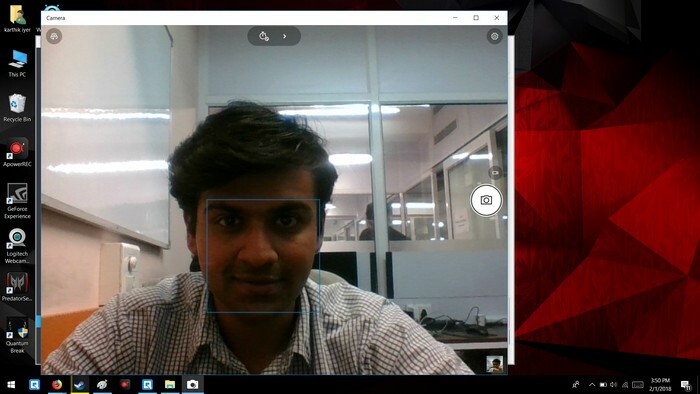 Windows Camera comes as a breath of fresh air as far as webcam software are concerned, as it brings a very minimalist UI which only features the core recording tools on the home screen, occupied almost entirely by the view in sight of the webcam. 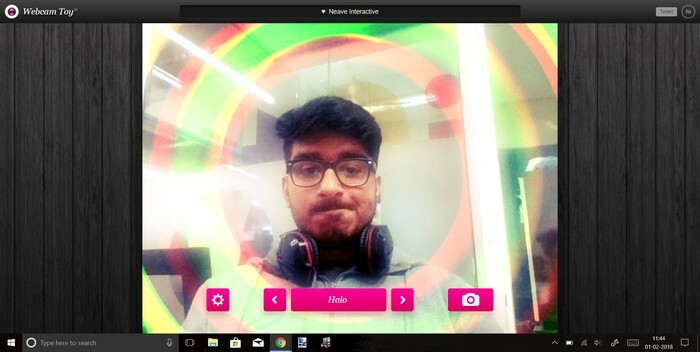 Microsoft’s webcam software can capture photos in two aspect ratios viz.16:9 and 4:3, and comes with four framing grid options which include crosshairs and Golden Ratio among others. Videos can be only recorded at a frame rate of 30FPS in three resolutions, which are 360p, HD and Full HD. You can also choose to capture burst shots and activate a time lapse mode, that will let you capture multiple shots in succession until the camera button is pressed again. Well, these are our picks for the top 10 best webcam software you can download right now. The software we included in our list have been selected after an in-depth assessment of their UI, their versatility and ease of usage, not to mention the different requirements of a diverse audience. We hope that you go through the list and select the one that best suits your needs. What are your opinions about our list? Did we miss any webcam software that is truly useful and worth including in the list? Do let us know in the comments section below and tell us the webcam software you installed after reading the article.